Rupert Neve Designs has introduced the RNHP Precision Headphone Amplifier. Little Labs introduces the Monotor and Monotor Presenter headphone amps as well as the Salt instrument splitter. Waves Audio and Hear Technologies join forces to include Waves SoundGrid technology in the Hear Back PRO 16-Channel Personal Mixer System. Along with the DP88, PreSonus brought the small HP2 headphone amp to Summer NAMM 2015, which is designed for in-ear monitoring. French manufacturer Touellskouarn is attending Musikmesse where he is showing thee new Eurorack modules with unpronounceable names. Last new product that SPL will introduce at Musikmesse in Frankfurt, the Expansion Rack will transform your Phonitor 2 into a monitoring controller. 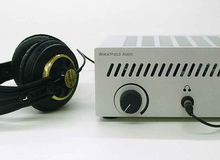 Only 4 months after the release of the Phonitor 2, SPL introduces at Musikmesse 2014 the Mini version of its headphone amp.